International cuisine has become very popular as recipes from different regions of the world are becoming an increasingly common part of our weekly menus. But what do we actually know about the lives of those often cooking these recipes for well-off families in Europe’s capital? 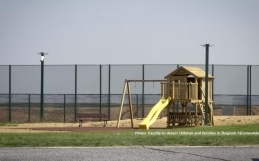 On 10 December 2013, the Organisation for Undocumented Workers (OR.C.A. 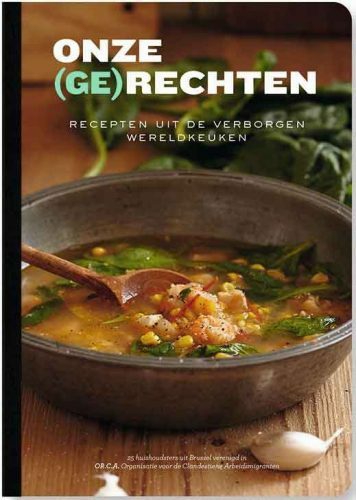 ), a Brussels-based member of PICUM, launched an extraordinary recipe book Onze (Ge) Rechten (“Our rights, our recipes”). 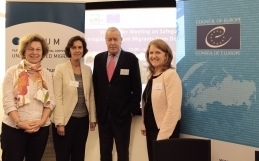 Combining ethnic cuisine with the personal stories of migrant domestic workers who – with or without a residence permit – live and work in the homes of their employer in Brussels, some of whom are high-ranking diplomats. This group of migrant domestic workers share the everyday recipes they cook for themselves and for their employers. A total of 26 recipes from four different regions of the world are found in this surprising cookbook, reaching from Chilean empanadas to adobong manok from the Philippines. I had the opportunity to taste this second dish – spicy marinated chicken: delicious! You will also find a selection of desserts – leche asada and halo-halo – as well as vegetarian dishes, such as dahl- coral lentils. Being an amateur cook, I was happy to find that the recipes are clearly explained and beautifully photographed which makes the preparation of these fabulous exotic dishes easily achievable and fun. But this book contains much more than just recipes. It allows migrant domestic workers to share their life stories, their different journeys to Belgium, their dreams and sacrifices in search for a better future for their families, and the often harsh realities of their experiences of living and working in private households. As Marlene Batioja from Ecuador says: “I didn’t have any more work in Spain [her first destination before coming to Brussels], so I decided to take a chance. We call that ‘buscarse la vida’, to do all my best to realise my dreams”. These strong, courageous women are trying to make the most of their experience. This, however, sometimes includes terrible violations of their labour rights, especially when their residence status is irregular. Ana Benavidez, a Latin America domestic worker, who remained in an irregular status after being exploited while working for diplomats in Brussels for five years, said: “I was treated as a slave at the embassy but that was like a ‘walk in the park’ compared to what I went through at the consulate; I didn’t have a bed to sleep, I had to sleep in a shed outside by the rubbish”. She thinks that you should always be smiling and doing your best at work so that your employers are happy as well and said when the photo was taken: “This is the first time that I am being photographed while I am working”. 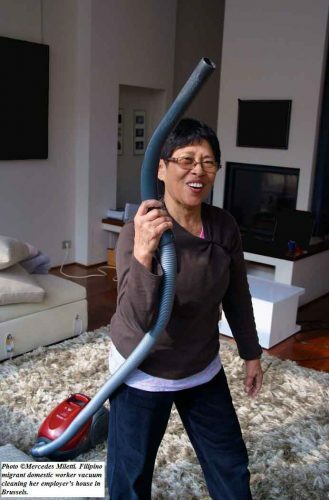 This photo was submitted to the ILO Migrant Domestic Workers in Europe Photo Contest in March 2013.
the adoption in 2011 of the ILO Convention concerning Decent Work for Domestic Workers (C189), the domestic worker movement has been growing and strengthening its influence and power. The book also outlines some of the most relevant articles of Convention 189, which entered into force on 05 September 2013. Until now, 14 countries have ratified the convention and one more is in the process to register at the ILO (Dominican Republic). 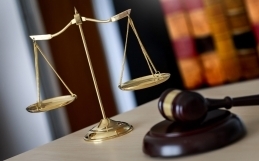 However, only two member states of the European Union (Italy and Germany) have ratified the ILO C189 while Belgium is close to doing so, as both the Federal and Flemish Parliament have already ratified it. Under the convention, migrant domestic workers are entitled to the same basic rights as other workers, such as the right to a minimum wage, social security coverage, overtime pay and weekly days off. Ratifying States must protect domestic workers from discrimination; ensure easy access to complaint mechanisms, offer decent living conditions and inform them of the terms and conditions of their employment. Lastly, the C189 also sets out rules regarding foreign recruitment, including requirements to regulate private employment agencies and the prohibition of deducting recruitment fees from the domestic workers’ salaries. As a volunteer, I had the opportunity to be part of weekly meetings for domestic workers, which OR.C.A. has been organising under the W.O.R.K – Women and men On Rights and life TalKing project since 2009. The aim of the project is to raise awareness of their rights and to provide them with the necessary tools to integrate in Belgian society. This includes French classes on Sunday afternoons, as well as information sessions on different issues such as labour rights, health care and cultural activities in Brussels. It was in the frame of this project, that the women came up with the idea of creating a book themselves. The book Onze (Ge) Rechten is already available in bookstores. In addition to providing some really great recipes, it makes the reader reflect on the relevance of domestic work, the essential contributions that domestic workers make to European society and their daily lives of –well-off families by looking after their children, by cleaning their houses, by cooking their everyday meals. It is time that domestic workers are fully respected and valued as skilled professionals and as workers with rights! At the moment, the book is only available in Dutch and French («Nos Droits sur le Plat»). This is Chile’s answer to the crème brulee, a sweet, cinnamon-lemon custard. Halo-halo is a very popular Filipino dessert, especially during the summer. ‘Halo’ means ‘mixture’ in Tagalog. It is a colourful mix of bananas, coconut and ube jam.